Haer Bears members had Sunday dinner at the 2018 4-H Achievement Banquet, with awards given to members from the previous 2017-2018 4-H year. Haer Bears members gathered at Bellemead Church on Nov. 16 to put together treat bags as a thank you to all the Mason County Law Enforcement and EMS personnel. The law enforcement officers received their bags on Nov. 19. Each veteran received a handshake and a “thank you” from the Haer Bear members, the club also thanked the veterans in the same parade and was able to get a picture with the Marines. Haer Bears members met at the Congressional Medal of Honor Park in Point Pleasant to put up red, white, and blue lights around the trees. The Haer Bears 4-H club kept themselves busy during the month of November. 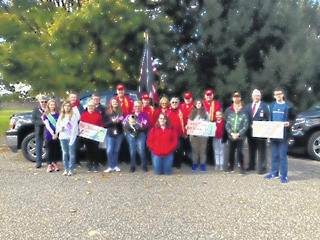 On Nov. 3, the Haer Bears members participated in the Veteran’s Day Parade that took place in Point Pleasant. The members walked along the parade route and stepped out of the parade if the member saw a veteran watching along the road. Each veteran received a handshake and a ‘thank you’ from the members, the club also thanked the veterans in the same parade and was able to get a picture with the Marines. On Nov. 4, the Haer Bears members met at the Congressional Medal of Honor Park in Point Pleasant to put up red, white, and blue lights around the trees. After setting up the lights, the members held their second meeting of the year at 3 p.m. The meeting was called to order by President Kenly Arbogast and the initiation of new members followed. Songs and pledges, devotions, and the secretary and treasurer’s reports were given. Lisa Arbogast gave the leaders report, reminding the members of the 4-H Achievement Banquet on Nov. 18. Old business reports on officer’s training, county new member initiation, flowerbed cleanup, tailgate health record handouts, Veteran’s Day Parade and putting up lights at the Congressional Medal of Honor Park were given. Members Faith Cook, Josie Hill, Kenly and Kenzy Arbogast, Lauren and Ethan Kincaid, Aria and Andrew Schoon, Kerstyn Clendenen, Audreanna Reed, and Shandy Williams reported on the different events. New business was then discussed among the members. The “That’s My Pan” fundraiser, clothing drive, and Blessing Box are to be continued with details later to come. The Angel Tree, a sponsor a child program the club decided to participate in, has items due on Dec. 17. The members of the club also decided to collect non-perishable food items for the Jackson Avenue Baptist Church food pantry, participate in collecting money out to Krodel Park during the lights on a date that is to be determined, and create law enforcement and EMS appreciation bags on Nov. 16 and deliver them in a few days afterwards. The club also decided to sponsor a wreath that the Mason County Teen Leaders have made to put on the graves on military veterans. Members are to keep an eye out for G-rated movies for a possible movie night. The club decided to not participate in putting up lights at the West Virginia State Farm Museum. Health Officer Madison Robinson reported on staying healthy by watching what you eat. The Meals on Wheels monthly project was put together and then the meeting was adjourned. Haer Bears members gathered at Bellemead Church on Nov. 16 to put together treat bags as a thank you to all the Mason County Law Enforcement and EMS personnel. The members made a total of 60 bags for all city, county, sheriffs, state and DNR officers from Mason County and a total of 41 bags for the EMS workers. The members present delivered the EMS bags to the EMS Center in Point Pleasant on the same day. There were a few extra bags distributed, along with the proper amount of gift bags, among the Point Pleasant, Hartford, New Haven, and Mason City Departments; the Sheriff’s Department in Point Pleasant; the WV State Police Department in Letart; and the DNR office for Mason County. The law enforcement officers received their bags on Nov. 19. On Nov. 18, members from the Haer Bears 4-H Club had Sunday dinner at the 2018 4-H Achievement Banquet. Awards given to members were from the previous 2017-2018 4-H year. Members were given either project pins for their fair projects, medals for excellence in project knowledge, and other county awards. Members Kenly and Kenzy Arbogast, Hill, Cook, Ethan and Lauren Kincaid, and Clendenen collected their awards and door prizes for their selves and collected other members’ awards for them in their absences. The Haer Bears 4-H Club is decorated among its members and the club got recognized for being a blue-ribbon club. Leader Lisa Arbogast and accompanying family members were able to witness the members achievements. https://www.mydailyregister.com/wp-content/uploads/sites/24/2018/12/web1_HB2.jpegHaer Bears members had Sunday dinner at the 2018 4-H Achievement Banquet, with awards given to members from the previous 2017-2018 4-H year. 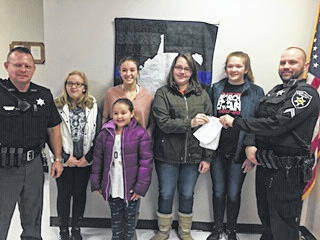 https://www.mydailyregister.com/wp-content/uploads/sites/24/2018/12/web1_HB2.jpgHaer Bears members gathered at Bellemead Church on Nov. 16 to put together treat bags as a thank you to all the Mason County Law Enforcement and EMS personnel. The law enforcement officers received their bags on Nov. 19.
https://www.mydailyregister.com/wp-content/uploads/sites/24/2018/12/web1_HB4-1-.jpegEach veteran received a handshake and a “thank you” from the Haer Bear members, the club also thanked the veterans in the same parade and was able to get a picture with the Marines. https://www.mydailyregister.com/wp-content/uploads/sites/24/2018/12/web1_HB4-2-.jpegHaer Bears members met at the Congressional Medal of Honor Park in Point Pleasant to put up red, white, and blue lights around the trees.